Corned beef is so easy to make using an Instant Pot Pressure Cooker and it is absolutely mouth-watering in these classic Homemade Reuben Sandwiches with Sauerkraut, Melted Cheese and Thousand Island Dressing. While this is the week for lots of recipes devoted to Corned Beef and Cabbage, I just can’t. First of all, there must be a million recipes for you to peruse online, so why do one more? Beyond that? I’m a fan of Corned Beef, but not so much the side of cabbage. Don’t get me wrong; I love Colcannon, a very traditional Irish dish that combines mashed potatoes and cabbage, I like a nice coleslaw as much as the next guy, and I love this warm cabbage slaw that I learned how to make from my dad. I’m simply not into the braised variety that most folks make for St. Patrick’s Day. So I’m bringing you my own take on Corned Beef and Cabbage today, these Homemade Reuben Sandwiches with Pressure Cooker Corned Beef. It’s got corned beef and there is cabbage in the form of sauerkraut so I’m good right? Sort of Irish. Sort of German. Sort of All American. Son of a gun…just like me! The origin of this sandwich is controversial at best and harsh words have been exchanged between families for years. Check out this article on Saveur for the soap opera history and maybe, like me, you’ll still wonder who invented the Reuben Sandwich! Several years ago I actually posted about this sandwich but I included it in a post sharing how to cure and cook your own corned beef. It got sort of lost in that post about one of my homemade Charcuterie projects plus the photos were so awful I needed to redo everything to make them look as good as this sandwich tastes. While that method remains the absolute best way to prepare corned beef, I’m like everyone else, sometimes time gets the best of me. So I decided today to spotlight it in a post by itself but with the effort I did this week that was both easy and quick and the results were still amazing. Since I was a bit short on time, my inclination was to buy some deli corned beef. That notion was seriously squelched immediately. $11.99 pound? Oh come on…it’s a tough piece of meat that’s been brined for a week…not a piece of cured gold! So I turned on my heel; found a butcher and was led to a cold refrigerator bin with packaged corned beef. It’s beef brisket in the brining liquid that also includes a seasoning packet to use during cooking. Done; especially on sale at $2.49 lb. Even after trimming the fat and cooking I had about 2 pounds of meat at the end; definitely worth doing yourself! Traditional methods call for braising the meat in the oven on low heat for 2.5 to 3 hours with a few additional ingredients and then slicing it in large chunks if serving next to cabbage or sliced thin across the grain if using for sandwiches. 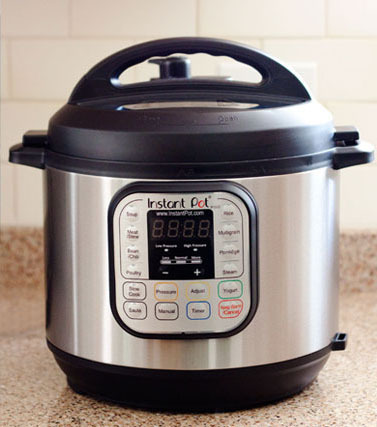 But I am one of a bazillion people who have re-discovered the beauty of pressure cookers, so I decided to try my hand at making it in my Instant Pot (if you’re un-initiated, there is a craze over electric pressure cookers; this is one of the brands available). Once again, it did not fail me. This could not have been easier and even with the time to get the ingredients to pressure and more time for some pressure release, the entire cook time was about 2 hours; just a bit more than half of the traditional method. I did it early in the day and it was totally hands off cooking. Is it any wonder electric pressure cookers have become the darlings of the cooking world? Once the meat is done and cooled a bit, it can be thinly sliced across the grain for use in this sandwich. From there it’s a pretty standard grilled or panini sandwich layered with corned beef, Swiss cheese, sauerkraut, and Russian dressing. Before I moved into my current home, I lived close enough to a deli to run up occasionally and order a Reuben Sandwich for takeout. No more; this took little preparation and was so remarkably better that there are no words. Except maybe OH MY YUM! 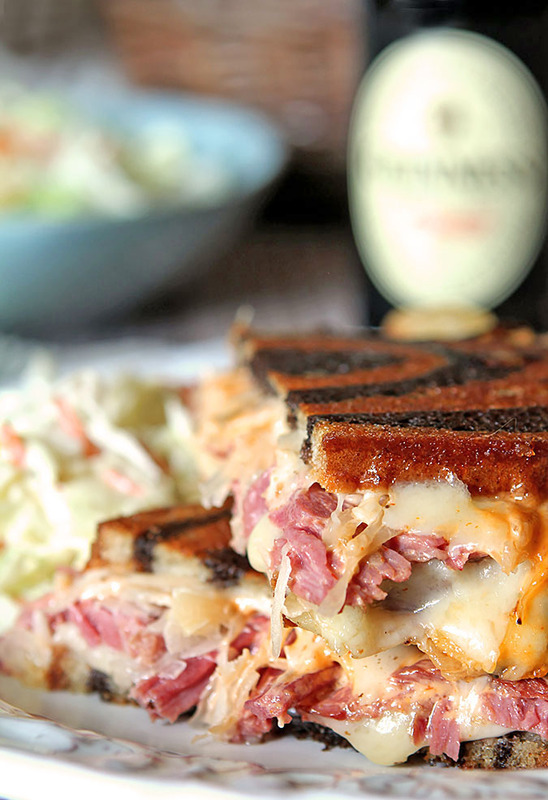 So, if you’re like me and the corned beef and cabbage thing is not your deal; celebrate the American way with a taste of Ireland combined with a bit of Germany, and indulge in one of these Homemade Reuben Sandwiches; they are simply delicious…and still perfect with a dark Irish beer! For The Russian Dressing: (Or used prepared Thousand Island Dressing - I like the Marie's brand). Unwrap and drain corned beef. Using sharp knife, carefully trim off excess fat. Rinse beef with cold running water. Put corned beef in cooking chamber of pressure cooker. Sprinkle with seasoning packet. Add bay leaves and garlic along the sides. Pour in beer and broth. Secure lid of pressure cooker, locking it in place following manufacturer’s instructions. Close pressure-release valve. Turn on pressure cooker. Set timer to cook under high pressure for 90 minutes. At end of cooking time, turn off machine. Unplug it. Leave pressure release valve closed for about 10 minutes or until pressure has returned to normal. Carefully unlock and remove lid. Transfer corned beef to cutting board and allow to cool enough to handle. Using sharp knife, cut meat across grain at an angle into thin slices. In a medium bowl, whisk together the yogurt, ketchup, onion, mustard, hot sauce, horseradish, Worcestershire, and cream. Chill for at least 2 hours to have the ingredients meld. Can also be used for salads, in egg salad, veggies or meat. Spread some butter on one side of each of the bread slices. 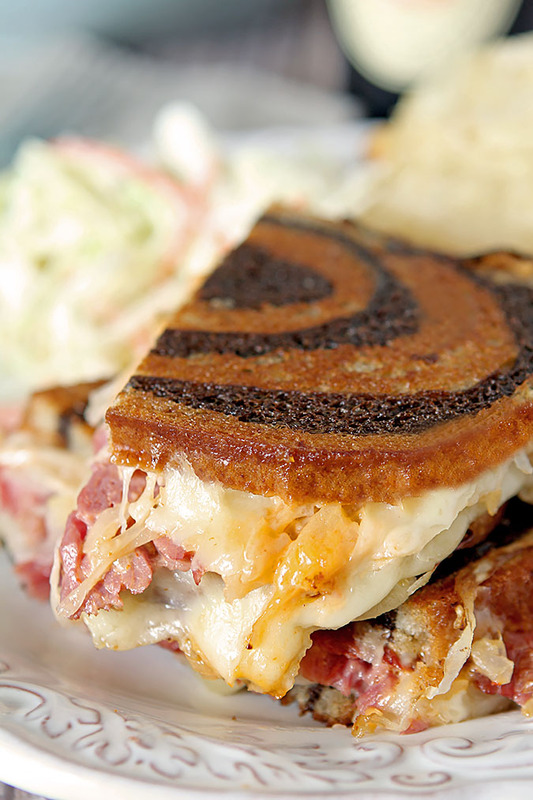 Layer in skillet in this order; one slice of bread with butter side placed down, Swiss cheese, corned beef, sauerkraut, Russian dressing, more cheese and top with 2nd slice of buttered bread, buttered side out. Gently grill on medium heat until the bread starts to brown on the bottom and the cheese starts to melt (covering with a slice of aluminum foil helps). Flip and grill 2nd side until brown and you can tell cheese has melted throughout. Remove from skillet and cut in half to serve. If desired, serve with coleslaw and chips. Put beef in pot and tuck garlic and bay leaves around meat and sprinkle with seasoning. Arrange cabbage wedges on their sides evenly around corned beef. Evenly place potato halves, carrot chunks, and onion quarters among cabbage wedges. Pour beer and broth over everything in pot and cook as directed above. No pressure cooker? No problem. I found a post at AllRecipes.com that shows how to do all three! I did do a bit of research on Russian dressing and found that it originally was made with yogurt, not mayonnaise and contained caviar which is most likely where it got the Russian moniker. Some people add pickles or chopped eggs but that really takes it more to the world of Thousand Island so I tried to stay within some confines of the original but without the caviar. Do I have to put the beer in it ? Will it still turn out good without the beer. No you don’t have to but it will need some additional liquid; you can use water but I would suggest even better might be chicken broth so there is a flavor component added that will be missing without the beer. I made this today & it was great. I haven’t eaten corned beef in 30+ years. I never liked it as a kid, but my husband & sons do, so I decided to make it for them & try it. It was so tender & delicious! So glad you took a leap of faith Rox and thanks for letting me know…much appreciated! 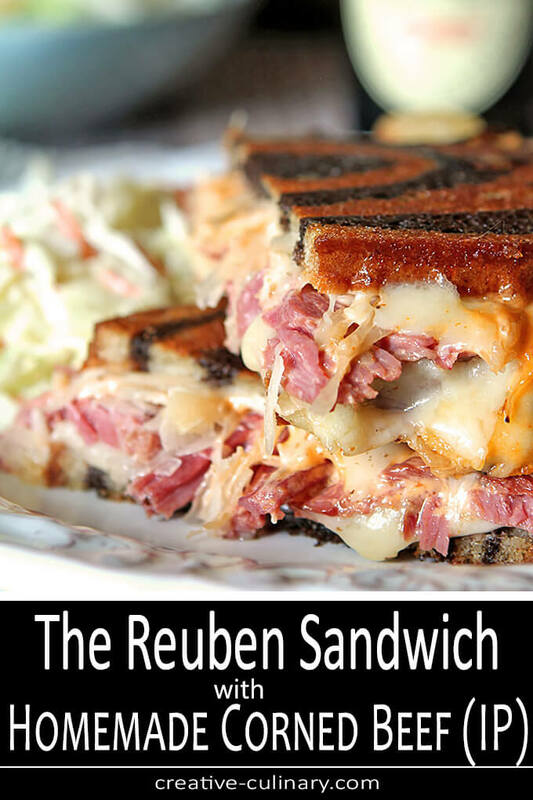 I will definitely be making Reubens following your recipe. Yum! Thanks John! I did the math too…I think I got closer to 2 lbs of meat from a 3 lb piece. It was on sale so for about $7.50 I got two pounds instead of paying $23. Admittedly my years of single mom-dom have forever instilled in me a certain frugality I can’t always escape but my change of heart was good since I was also able to try it in the pressure cooker; it was so easy and tasty! I honestly think you would love one; I know I do. I have two! My God – am I the only one who visits this site and drools from one end to the other? Your photography is so mouthwateringly gorgeous. I could devour this sandwich and then wish I had room for another. Well, I hope not! I don’t get many comments though so I do love hearing from someone who loves what I do. And the truth is, when I first started this blog I loved to cook…but my photos, in a nutshell, sucked. I had never played with photography or had an interest and it’s been a long yet fun trip into something I never expected. I’ve come to love the photo setup and experience as much as the cooking experience. If that shows? YEAH!!! Hearing from someone that notices? Makes my DAY/WEEK/YEAR!!! !